Western Digital’s latest My Passport Studio has a solid build and multiple connections, but slow transfer speeds and a preinstalled security app hamstring an otherwise decent drive. Unlike the My Passport Essential’s ( ) plastic exterior, the My Passport Studio is made from anodized aluminum with a black case and silver edges, giving it both a durable build and professional look. The drive weighs 0.75 pounds, which doesn’t sound like a lot, but it feels sturdy when you hold it in your hand. The drive has a USB 2.0 port and two FireWire 800 ports, and with a tiny activity light. The My Passport Studio comes preformatted for the Mac, so there’s no need to reformat it. You get the necessary cables (though no FireWire 800 to FireWire 400 cable), along with a Quick Install guide and warranty information. A full digital version of the user’s manual is included on the drive itself, or you can download it from Western Digital’s website. We tested the 1TB version, but WD sells a 500GB version for $170 and a 750GB drive for $200. Every time you connect the Passport Studio to your Mac, you’re greeted by Western Digital’s Unlocker software, which requires you to type in a preset password before you can begin using the drive. [Editor's note: This was our experience with the evaluation unit used for testing. A WD representative says that with brand new drives, the Unlocker software should not ask for a password. This is to allow you to delete the software if you wish.] To get around it, you have to use the provided WD Security app. Once installed, you change the password or stop Unlocker from showing up by removing any required password. I’d prefer that Western Digital let the customer decide if they want to use their security app or not, and I find it unfortunate that you’re forced to install extra software in order to deal with a preinstalled app on the My Passport Studio. But it’s possible that you may welcome the extra security the software provides. In every test we conducted, the My Passport Studio’s USB 2.0 transfer speeds were a bit on the slow side compared to similar drives. It netted 28.6MBps in our 2GB folder write test and 31.3.MBps in our 2GB file write test over USB 2.0. In contrast, the G-Drive Mobile ( ), a USB 2.0/FireWire 800 portable drive released over a year ago, obtained 30.8MBps in the 2GB folder write test and 31.7MBps in the 2GBfile write test. The My Passport Studio finished our low-memory Photoshop test in 90 seconds, one of the slowest times among the portable hard drives we’ve tested. The drive faired slightly better over FireWire 800, where it posted 55.8MBps in the 2GB folder write test and 67.1MBps in the 2GB file write test. It also completed the Photoshop test in 64 seconds. Compared to other FireWire portable drives we’ve tested, the transfer rates were more middle-of-the-road, and the Photoshop time was sluggish, unable to surpass other drives. That’s too bad, since the drive is marketed to creative professionals, who generally need as much speed for their projects as they can get. 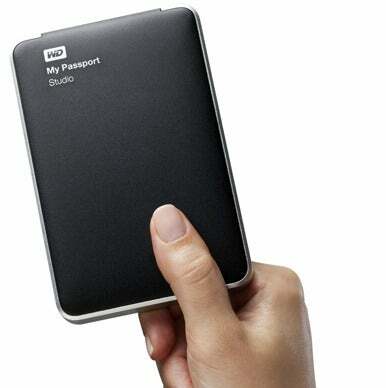 The My Passport Studio looks good and is overall a decent drive. But it lags in the speed department and has a security app that doesn’t disappear without intervention. Editor's note: Updated 3/23/12 at 10 a.m. PT with information about the Unlocker software on brand new drives.